Primarily recorded at RAK Studios during the back end of 1992 and early 1993 “Fate of Nations” was Robert Plant’s sixth solo outing and remains his most Zeppelin like solo record. In fact it is difficult not to argue that if Zeppelin had been able to continue into the nineties that this would have been the exact type of recording they would have been making. Elements of Zeppelin going as far back as Led Zeppelin III are evident as well as the more obvious similarities to the later albums. That is not to say though that this is a poor mans Zeppelin album. Quite the opposite in fact and I will argue long and hard that this is Robert Plant’s most consistent and well rounded album. Often cited as a cry to Jimmy Page to work together again opening track ‘Calling To You’ could also be Plant displaying to David Coverdale who was at the time collaborating with Page that when it came to Zepplinesque vocals he was still the master. After an almost gentle intro the track comes to life as a hard hitting fast paced cousin of ‘Kashmir’ with a trademark pouting Plant vocal. The guitar work from Kevin Scott McMichael is spot on and Nigel Kennedy’s violin compliments it perfectly driving the riff along before exploding into a frantic finale. ‘Down To The Sea’ is less frantic but no less enjoyable. Think of one of those folky workouts from Led Zeppelin III or Physical Graffiti rocked up with a huge chunk of eastern mysticism added and you’ve pretty much got the idea. ‘Come Into My Life’ is the first of the slower songs and is literally dripping with emotion. The backing vocals of Maire Brennan, harmonium of Phil Johnstone and hurdy gudy of Nigel Eaton creating the perfect backdrop for a husky passion filled Plant vocal. The power is back with ‘Memory Song’ which opens with a particularly heavy riff that remains prominent throughout. Some acoustic guitar is layered on top in parts but in truth the song really fails to go anywhere. It is one of the few weak links on the album for me but that may of course come from following the five excellent tracks that started the album off. The cover of Tim Hardin’s ‘If I Were A Carpenter’ is next and takes Plant right back to his days on the folk circuit of the Black Country. Hardin’s tracks for me have always been better when performed by someone else and Plant re-iterates that view for me here as his version is far superior to the original. The string arrangement by Lynton Maiff and mandolin of Maartin Allcock setting off the track nicely. ‘Colours of a Shade’ starts off with an almost spanish guitar intro from Allcock who also plays mandolin again and Aeoleon pipes along with Chris Hughes. All this provides an extremely atmospheric, almost ethnic and beautiful backing for another sublime Plant vocal. For some reason this track was left off some non UK issues of the album. A curious decision to say the least but one which has been rectified on subsequent issues. ‘Promised Land’ sees a return to the band sound and is another fast paced riff driven track that wouldn’t have been out of place on one of the later Zeppelin albums. Along with the earlier ‘Memory Song’ it is, for me at least, lacking in the quality of the other tracks. The next two tracks ‘The Greatest Gift’ and ‘Great Spirit’ have been described as Plant’s most heartfelt vocals ever and whilst that may not be entirely correct they are certainly up there with the best of them. One thing that can’t be denied though is that this is certainly Plant’s most personal album. The lyrics throughout giving rare glimpses into the mans soul and inner feelings on a variety of subjects. The posturing rock God and hiding behind Tolkien themes and imagery is long gone and what we have here is an artist reaching into the very depths of their being and laying it out there for all to see and it is indeed the greatest gift he can give us. Plant displays his love of the ethnic and of eastern mysticism once more with the truly wonderful ‘Great Spirit’. Rarely has a song about social conscience and the self destructive nature of the human been so beautiful and also so uncondescending. You actually believe by the end of it that Plant truly believes every word he has sung. Packed full of feeling and soul it demonstrates a side of Plant’s vocal ability which is sadly overlooked by many, and is one which he goes back to all to infrequently. There is an argument that this is the best track on the album. High praise indeed but fully deserved. The closing track ‘Network News’ is a fast paced angry swipe at the purveyors and surveyors of the worlds demise and is almost a parallel delivery of the previous tracks message. If ‘Great Spirit’ was saying it with love then ‘Network News’ is saying it with a mighty uncontrolled anger. 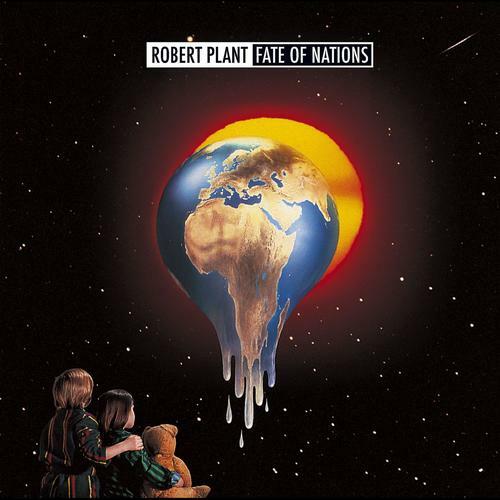 “Fate of Nations” is unfairly overlooked by many as Robert Plant’s ‘social conscience album’. For me though it is the perfect Robert Plant album. It highlights all of his vocal and songwriting abilities and sees him reaching new heights as a lyricist. Far superior to any of the subsequent Page/Plant releases it is undoubtedly the jewel in the crown of Plant’s solo career. In fact it is so good as a listening experience that I believe it is second only to Led Zeppelin II in Plant’s entire back catalogue.